Our mobile preset is .DNG file format which is different from the standard Lightroom preset .lrtemplate file that's designed for Lightroom desktop only. In this tutorial, you will be using Google Drive to facilitate transferring our mobile preset from your computer to your phone. You may opt to use a different file storage platform other than Google Drive such iCloud or Dropbox; however, we cannot advise how to get our mobile preset from those platforms to your mobile phone. Basic knowledge of using Lightroom and the apps listed above is also required. Never double-click on the mobile preset file from your computer. This action can reset our preset settings. You must install the mobile preset file exactly as described below. Do not upload the zip file to your Google Drive and unzip it from there. This will rset our preset setting. You should ONLY upload the mobile preset file to Google Drive. Locate our mobile preset file (.DNG file format) in the zip file folder. 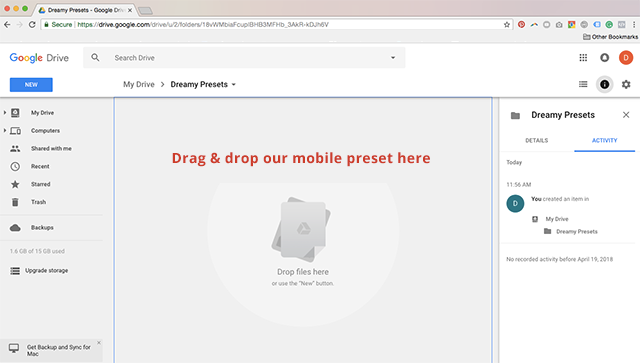 Upload only mobile preset file (as seen above) to your Google Drive account from your computer. DO NOT upload the zip file. Sign into your Gmail Account > Go to drive.google.com > Click the "New" button (top left) and create a new folder called "Dreamy Presets" > Upload our mobile preset into that folder. If you cannot drag and drop the file, please click on the NEW button (far top left as seen in the screenshot below) to upload manually instead. 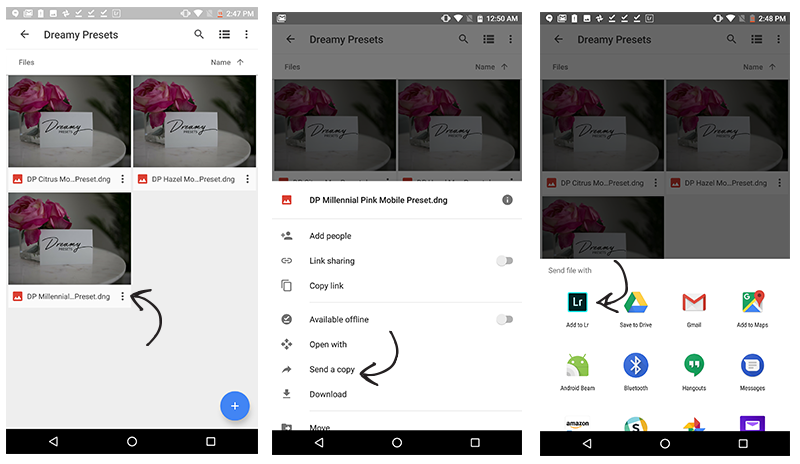 From your iPhone, Open the Google Drive app > Find our mobile preset file > Click on the “three dotted icon” to the right of the file > Select “Send a Copy” > Select “Save Image” option. Please Note: Saving may take up to a minute or longer depending on your internet connection due to the large file size (27 MB). Please wait and do not exit the screen! Depending on your iOS version, you may not have the option to "Save Image". 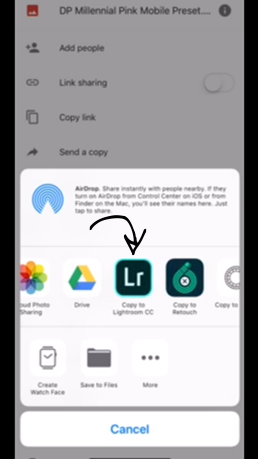 If you don't see that option, you can click on the "Lightroom CC App" icon to open the file directly in the app. This option is not available on all iOS versions. If "Save as Image" or "Open in Lightroom" is not available, it's very likely that you uploaded the zip file instead of the mobile preset file. You will need to delete the zip file from Google Drive and restart from step #1. If you did only upload the mobile preset file, but you still don't have the "Save as Image" or "Open in Lightroom" option, you can choose the Text Message option and text the mobile preset file to yourself (Send a copy > Text message (green chat) icon). Then open the text message from your phone and save as image to your camera roll. Open Lightroom CC App > Click on the “+” icon to create a new Album. Title this album “Dreamy Presets”. This is where you will import our mobile preset. That’s it! From here you can continue editing your photo as you please. If you want to apply our preset to another photo, simply repeat step #6. You must copy and paste the settings every time you want to apply the preset to a new photo. Lightroom mobile app does not remember the last settings you pasted. 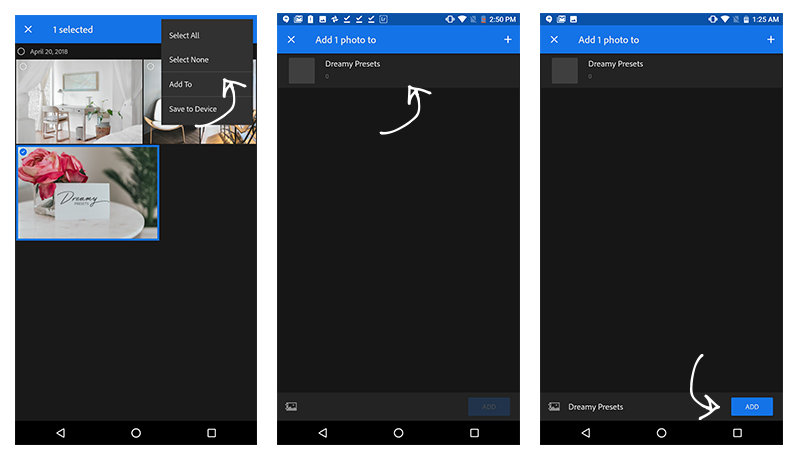 Upload our mobile preset file to your Google Drive account from your computer. 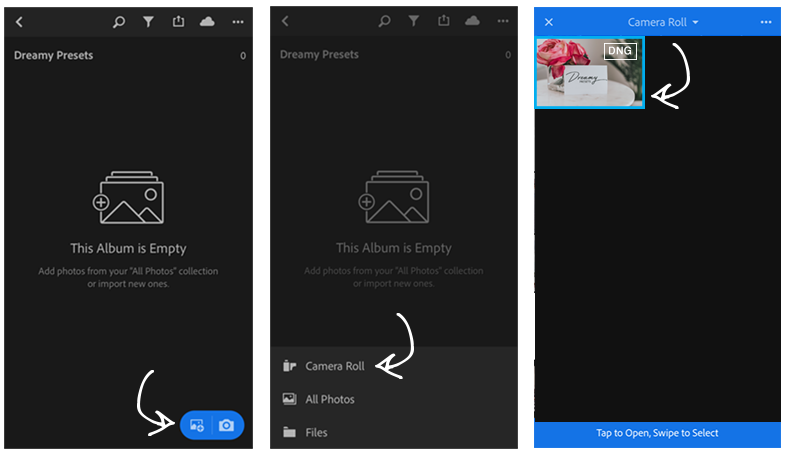 From your phone, Open the Google Drive app > Find our mobile preset file > Click on the “three dotted icon” to the right of the file > Select “Send a Copy” > Select “Lightroom app” option. This will save the file to your Lightroom CC app photo album. Please Note: Saving may take up to a minute or longer depending on your internet connection due to the large file size (27 megabyte). So please be patient and do not exit the screen! 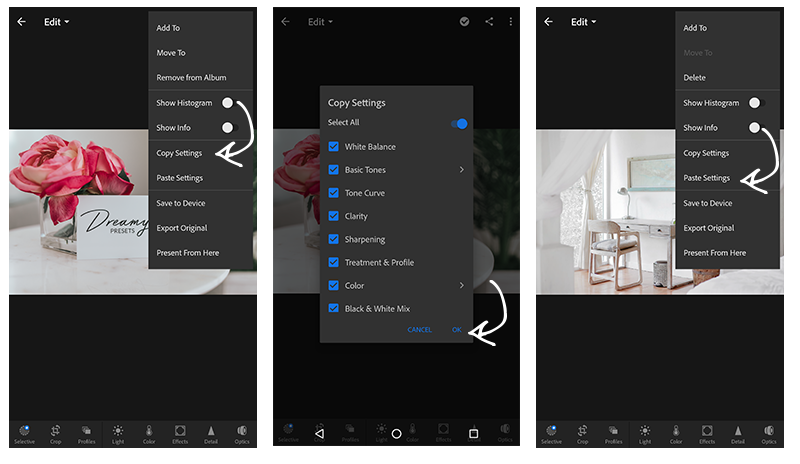 On Lightroom CC app homepage, click on the “+” icon to create a new Album. Title this album “Dreamy Presets”. This is where you will add our mobile preset so you can find it easily in the future. 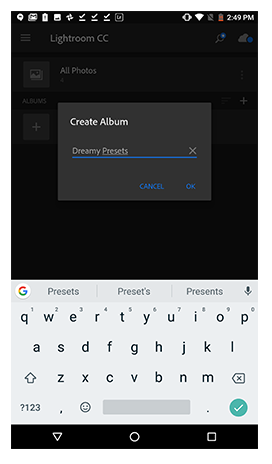 Locate our mobile preset and select it > Click on Add To > Select "Dreamy Presets" folder > Click on Add. That’s it! From here you can continue editing your photo as you please. If you want to apply our preset to another photo, simply repeat step #6. If you did upload the mobile preset file and not the zip file, and you still don't have the "Save as Image" or "Open in Lightroom" option, you can choose the Mail option and email to yourself (Send a copy > Mail icon). Then save the mobile preset file to your camera roll and continue onto the next step below!